Our mission is to help individuals and families, as they seek to improve their quality of life. As a community-based organization we rely on change agents like you. Please consider making a tax-deductible donation, which will help support our efforts and strengthen our community. We invite you to volunteer and help raise up your community today! They’re many possibilities and opportunities in which need your help right now. Let’s begin by UPLIFTING one another. With the support of people, from all walks of life, we are confident that SC Uplift’s efforts will help reverse the current state of those in need. I know a little bit about high performing nonprofit organizations. Although I cannot give you more than 50 years of evidence to support this statement, I will give you one example from my long history in the nonprofit sector. In 1994, a manual that enabled the residents of South Carolina, and anyone else who wanted to set-up a nonprofit organization in that state became accessible via the public library system. I wrote that manual voluntarily. And, with the support of the then Secretary of State was able to ensure that no one interested in creating a nonprofit would not be able to do so. That year was the convergence of several things relevant to this sector in the state; 1. The SC General Assembly passed a nonprofit corporation law for the first time ever, 2. The state was primed for an explosion of nonprofit organizations with widely diverse missions; and, 3. The Internet had not yet become the source of information on every conceivable topic it is today; and the fact is only a relatively small percent of South Carolinians had access to a computer. With the very capable help of Maggie Bostic as a document designer, we made the cut and the rest of the story about the manual is one for the books. In the 24 years since then, I’ve had the good fortunate to assist people in South Carolina and around the country with the formation of every conceivable type of nonprofit organization and more complex structures in which the nonprofit organizational form has a key role. It has been challenging, exhilarating and gratifying. Standing out from all of them is SC UpLift Community Outreach a community-based community development organization that has operated in Aiken, Chester, Fairfield, Kershaw, Lexington, and Richland Counties to ensure that poor and moderate income elders and families have quality, safe homes to live in. Among the folks who have benefited from SC UpLift are homeless Veterans, elderly people and a lot of struggling young families with minor children. SC UpLift has been generous in its support of other community based initiatives in devastated and low income neighborhoods by serving as fiscal agent for wide ranging local programs that would not have received funding without SC UpLift standing in the gap. Most impressive about SC UpLift is its faithful adherence to accepted standards of high performing practices known to be critical to the sustainability of nonprofit organizations. They operate within the tight but essential boundaries of impeccable integrity. The organization’s executive leader is Kevin Wimberly who with his wife Tammy are the founders. Affordable housing is at its core and all of us have special feelings about what a home means in our own lives. While the organization directly engages in different strategies to remain focused on its mission, it is especially adept at finding collaborative ways with individuals and other groups to provide services in low income and devastated communities so their members receive and participate in other activities that “round out” what “community” really means in the broadest sense. These ventures have covered educational, historic, and social needs whose developers frequently ask UpLift to serve as fiscal agent for grants to support community-initiated activities—a vital function when neighborhoods lack access to a federally exempt nonprofit organization. This organization is one in which I take great personal and professional pride. SCUplift’s adherence to the standards of high-performing nonprofit organizations has made possible better lives for thousands of South Carolina’s low to moderate income communities. And that folk, is the major expectation of all nonprofit organizations that enjoy the benefit of federal tax exemption and the privilege of indemnification. Your monetary support of this organization will be rewarded with a consultation with Kevin on any aspect of concerns you may have about an organization that is special to you. Upon request I will join Kevin in this process. Tax deductible donations can be made on-line at www.scuplift.org at the “donate now” button on the home page or you can mail your check to SC UpLift Community Outreach, P.O. Box 3728, Columbia, SC 29230.
https://www.wltx.com/article/news/local/scs-first-senior-smarthome-caters-to-seniors-who-cant-afford-assisted-living-care/101-615407068 SC's first Senior SmartHOME caters to seniors who can't afford assisted living care The old, abandoned home in the 3000 block of Judy Street was once on a list to be demolished. After months of renovation, the building is now South Carolina's first Senior SmartHOME. Author: Alicia Neaves Published: 9:36 PM EST November 16, 2018 Updated: 10:21 AM EST November 17, 2018 Columbia, SC (WLTX) -- What was once a run-down, boarded up house in a northeast Columbia neighborhood is now making history. The old, abandoned home in the 3000 block of Judy Street was once on a list to be demolished. After months of renovation, the building is now South Carolina's first Senior SmartHOME. "You would have probably even laughed at us when we told you what our plans were for this particular property," said Shaun Owens, Director for Strategy and Innovation for the USC SmartHOME Center for Economic Excellence. The Senior SmartHOME became a reality thanks to a partnership between the non-profit SC Uplift Community Outreach, Palmetto Health and USC. "I think now when you walk in the door, you'll be met with a certain amount of promise," said Owens. It's a 2 bedroom/1 bath home of the future. It features energy efficient appliances, slip resistant floors, wide doors and an automated security system. "[Homeowners will] be able to go through an app to turn the lock on and off," said Kevin Wimberly, President & CEO of SC Uplift Community Outreach. Wimberly says the home will be ADA compliant, including pull-down shelving in the kitchen to make it easy for seniors to live comfortably. "As well as the roll-in shower for someone who has the wheelchair to be able to go right into the shower," said Wimberly. The house is catered to to those who can't afford assisted living care, with the goal of helping them age in place. "Being able to provide this home where they're able to age in place is just something that we greatly envisioned and we're excited," said Wimberly. Through Telehealth at Palmetto Health, homeowners will also be able to talk with their doctor in the comfort of their home. "What we're doing is creating technology and programs that are very easy for older adults to use regardless of how proficient they are with technology," said Amelia Bischoff, with Telehealth at Palmetto Health. Through a TV screen, patients can refill medications, get a diagnosis, and experience medical educational opportunities. "With providers having busy, packed schedules, maybe not being able to fit patients in at the last minute, this provides a different avenue for patients to receive care," said Dr. Christopher Gainey of Palmetto Health, as we interviewed him using the home's Telehealth technology Friday. SC UpLift Community Outreach plans to build a similar project in the future. Eventually, they're hoping to evolve this concept into a "smart village" community for seniors who qualify. SC Uplift Community Outreach is taking applications now from seniors who qualify to live in the home. You must be 62 or older, living at 60% or below the area median income. To learn how you can apply to live in the SmartHOME, call (803) 691-4742 or click here. Founded in 2008, SC Uplift Community Outreach is a federally exempt community development corporation that provides affordable housing for low to moderate income individuals and families. 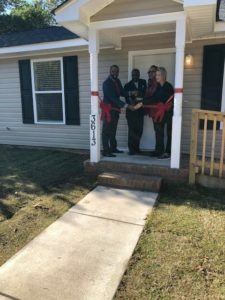 Since 2009, they have received approximately $726,000 to develop and provide various affordable housing projects in the midlands region of South Carolina. The non-profit has also been able to assist approximately 60 seniors with home repairs to maintain the health and safety of their homes. SC UpLift Legacy Home for Older Adults will be a universal designed two bedroom/ one bath home designated as an affordable senior rental property. The home will feature multiple technologies that will enable an older adult to age in place including energy efficiency appliances, anti-fatigue flooring to prevent fall-related injuries, a tele-health system, and a security and automation system. In addition the home will be wired to incorporate future technologies as they become available. The property will be rented to a senior age 62 or older whose income is 60% or below AMI. Renovations will begin mid-June and the property will be available for occupancy October 2018. Rental applications are currently being accepted. For more information contact Kevin Wimberly |(803) 691-4742| kevinwimberly@scuplift.org. This is a historic collaborative effort between SC Uplift Community Outreach, Richland County Community Development, the University of South Carolina’s SmartHOME Center for Economic Excellence, and Palmetto Health. Picture 2: (L to R) Pastor Clyde Holliday, Trenholm Acres Neighborhood President; Jocelyn Jennings, Richland County Community Development; Kevin Wimberly, SC UpLift Founder/CEO; Dr. Shaun Owens, USC Professor and Director of South Carolina’s SmartHOME Center for Economic Excellence; Amelia Bischoff, Palmetto Health. Founded in 2008, SC Uplift Community Outreach is a federally exempt community development corporation that provides affordable housing for low to moderate income individuals and families. Since 2009, we have received approximately $726,000 to develop and provide various affordable housing projects in the midlands region of South Carolina. We have also been able to assist approximately 60 seniors with home repairs to maintain the health and safety of their homes. It has been a rewarding experience to work with an organization that is so deeply embedded in the fabric of our community. SC Uplift demonstrates the hope we need to solve the housing storage in our community.